The Samaritan's Purse safe migration project in the highlands of Vietnam equips students with the knowledge they need to avoid becoming a trafficking victim. When despair turns into a way of life, some families in northern Vietnam become desperate for a way out. Parents grow weary of struggling to survive in poor, mountainous farming communities and long for a way to better provide for their children and give them hope of a brighter future. 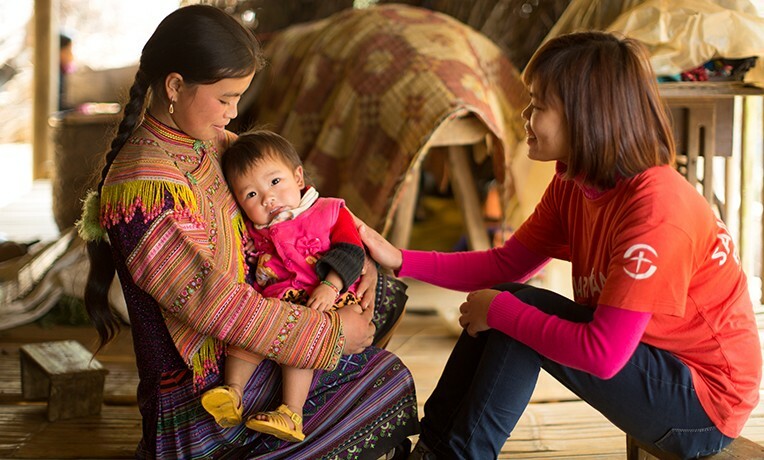 We’re working in isolated mountain communities of northern Vietnam. That longing leads some adults, and even teenagers and children, in the highlands to take dangerous risks as they cross into bordering countries in search of employment. Sadly, these migrants are often unaware of the potentially deadly chances that they’re taking. Human trafficking of many types is a real threat in this part of Asia. Samaritan’s Purse is working to decrease trafficking in northern Vietnam by partnering with schools to teach children and teenagers about safe migration. Students at Tinh’s school are in grades six to nine, and most are ethnic minorities such as Hmong. More than 200 students stay in the school’s dormitory because they live far away. Tinh said trafficking is a problem in his isolated community, as the people who migrate don’t always return home. His students are especially likely to become trafficking victims if they don’t understand the dangers lurking beneath the seemingly hopeful promise of a better life. Most students in our training have never learned about safe migration. These students live in remote areas and lack access to information about migration or human trafficking. “They are not aware of what may happen to them—they just see opportunity for a good job and a chance to provide for their family,” said Ha Tran, Samaritan’s Purse safe migration project coordinator. Samaritan’s Purse is training teachers in schools throughout northern Vietnam so that they can teach their students about safe migration. We’re teaching about the terrible motives behind trafficking, who can become a victim, and common ways traffickers deceive people. Most Vietnamese in the highlands who migrate cannot afford or do not have access to documents such as a passport, visa, or work permit, and migration without proper documents can be perilous. People may be forced to work long hours without receiving their promised salary or any compensation at all. Women can be sexually exploited. Children are illegally adopted and thrust into labor trafficking. Students who participate in our training are less likely to become trafficking victims. Most families in the Vietnam highlands are farmers and ethnic minorities. Northern Vietnam boasts beautiful mountain terrain. We're training teachers to equip students about the dangers of migration. Many students who attend our migration training live at their school's dormitory because their home is far away. Our migration project is helping students to stay safe and to stay in school. Ha explained that for those fortunate enough to flee their captors, returning home doesn’t always include a warm welcome. People who migrate and return are discriminated against and criticized for leaving behind their home and family and friends. “It’s difficult for victims to reintegrate into their communities and to start their lives all over again,” Ha said. By increasing awareness about the dangers of unsafe migration, Samaritan’s Purse staff members trust more Vietnamese children will grow up in a safe environment. Giang dreams of being a teacher when he grows up. Giang, an eighth-grader at Tinh’s school, participated in the Samaritan’s Purse safe migration training. No one had ever warned him about what might happen if he crossed the border. “I learned about tricks of traffickers and how to migrate safely,” Giang said. He learned that he should never go anywhere with a stranger, even if they promise to give him money. He should never cross the border without first seeking counsel from trusted adults and teachers. Giang is a dormitory student and “it’s difficult because I have to stay far away from my loved ones,” he shared. Yet, Giang loves to learn and excels in school, especially English and math. He wants to be a teacher when he grows up. Please pray for protection for children like Giang who are growing up in northern Vietnam. Pray that they will come to know God’s love and purpose for their lives. Vietnam Projects Vietnam has made tremendous economic progress in recent years, but many families, especially among ethnic minority groups, still struggle daily. Samaritan’s Purse is providing welcome relief in the remote northern highlands and in Hanoi through projects that address a wide range of needs: medical care, trafficking prevention, mother/child nutrition, livelihoods training, winter clothing, water and sanitation, livestock management, parenting skills, vocational training, and advancement for the disabled.